One of the things that defines humans most is our ability to read others’ minds – that is, to make inferences about what others are thinking. To build or maintain relationships, we offer gifts and services – not arbitrarily, but with the recipient’s desires in mind. When we communicate, we do our best to take into account what our partners already know and to provide information we know will be new and comprehensible. And sometimes we deceive others by making them believe something that is not true, or we help them by correcting such false beliefs. All these very human behaviors rely on an ability psychologists call theory of mind: We are able to think about others’ thoughts and emotions. We form ideas about what beliefs and feelings are held in the minds of others – and recognize that they can be different from our own. Theory of mind is at the heart of everything social that makes us human. Without it, we’d have a much harder time interpreting – and probably predicting – others’ behavior. For a long time, many researchers have believed that a major reason human beings alone exhibit unique forms of communication, cooperation and culture is that we’re the only animals to have a complete theory of mind. But is this ability really unique to humans? In a new study published in Science, my colleagues and I tried to answer this question using a novel approach. Previous work has generally suggested that people think about others’ perspectives in very different ways than other animals do. Our new findings suggest, however, that great apes may actually be a bit more similar to us than we previously thought. Decades of research with our closest relatives – chimpanzees, bonobos, gorillas and orangutans – have revealed that great apes do possess many aspects of theory of mind. For one, they can identify the goals and intentions behind others’ actions. They’re also able to recognize which features of the environment others can see or know about. Where apes have consistently failed, though, is on tasks designed to assess their understanding of others’ false beliefs. They don’t seem to know when someone has an idea about the world that conflicts with reality. Picture me rummaging through the couch because I falsely believe the TV remote is in there. “Duuuude,” my (human) roommate says, noticing my false belief, “the remote is on the table!” He’s able to imagine the way I’m misconstruing reality, and then set me straight with the correct information. 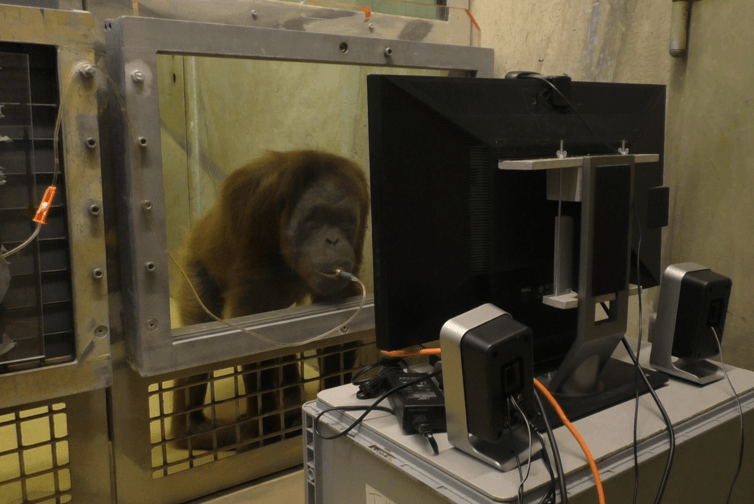 To investigate false belief understanding in great apes, comparative psychologist Fumihiro Kano and I turned to a technique that hadn’t been used before with apes in this context: eye-tracking. Our international team of researchers enrolled over 40 bonobos, chimpanzees and orangutans at Zoo Leipzig in Germany and Kumamoto Sanctuary in Japan in our novel, noninvasive experiment. Researchers use juice to attract the apes to the spot where they can watch the videos. We showed the apes videos of a human actor engaging in social conflicts with a costumed ape-like character (King Kong). Embedded within these interactions was important information about the human actor’s belief. For example, in one scene the human actor was trying to search for a stone that he saw King Kong hide within one of two boxes. However, while the actor was away, King Kong moved the stone to another location and then removed it completely; when the actor returned, he falsely believed the stone was still in its original location. The big question was: Where would the apes expect the actor to search? Would they anticipate that the actor would search for the stone in the last place where he saw it, even though the apes themselves knew it was no longer there? While the apes were watching the videos, a special camera faced them, recording their gaze patterns and mapping them onto the video. This eye-tracker let us see exactly where on the videos the apes were looking as they watched the scenarios play out. Apes, like people, do what’s called anticipatory looking: They look to locations where they anticipate something is about to happen. This tendency allowed us to assess what the apes expected the actor to do when he returned to search for the stone. Strikingly, across several different conditions and contexts, when the actor was reaching toward the two boxes, apes consistently looked to the location where the actor falsely believed the stone to be. Importantly, their gaze predicted the actor’s search even before the actor provided any directional cues about where he was going to search for the stone. The apes were able to anticipate that the actor would behave in accordance with what we humans recognize as a false belief. The red dots show the ape looking at the place where he anticipates the person will search – even though he himself knows the stone has been moved. Our findings challenge previous research, and assumptions, about apes’ theory of mind abilities. Although we have more studies planned to determine whether great apes can really understand others’ false beliefs by imagining their perspectives, like humans do, the current results suggest they may have a richer appreciation of others’ minds than we previously thought. Great apes didn’t just develop these skills this year, of course, but the use of novel eye-tracking techniques allowed us to probe the question in a new way. 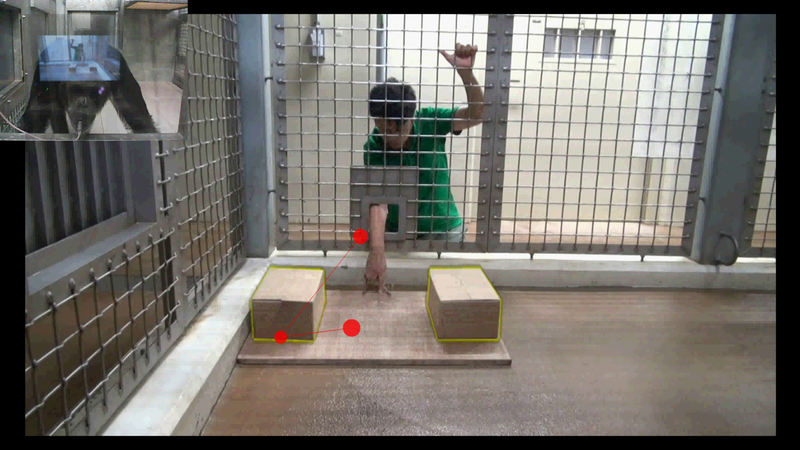 By using methods that for the first time assessed apes’ spontaneous predictions in a classic false belief scenario – with minimal demands on their other cognitive abilities – we were able to show that apes knew what was going to happen. At the very least, in several different scenarios, these apes were able to correctly predict that an individual would search for an object where he falsely believed it to be. These findings raise the possibility that the capacity to understand others’ false beliefs may not be unique to humans after all. If apes do in fact possess this aspect of theory of mind, the implication is that most likely it was present in the last evolutionary ancestor that human beings shared with the other apes. By that metric, this core human skill – recognizing others’ false beliefs – would have evolved at least 13 to 18 million years before our own species Homo sapiens hit the scene.